The General Aviation Safety Council (GASCo) delivers Safety Evenings on behalf of CAA. The evening is designed to provide an opportunity to reflect on General Aviation safety as it affects you, the people you fly with together with your clubs and associations and will be given by a GASCo Regional Safety Officers (RSO). We hope that by the end of the evening you will have identified some ideas that you can build on to make your flying even safer and that you will feel able to share your thoughts with other members of the audience. Our RSOs who are all volunteers and active GA pilots in their own right are certainly not here to preach to you and their aim is to facilitate a useful, thought-provoking and enjoyable exchange of views on how to improve flight safety. They will share some of the latest information together with their thoughts and ideas with you during the evening. Although some of the information is well known, the accident statistics show that many contributory factors identified in Air Accidents Investigation Branch reports are actually quite fundamental so if at times we appear to be ‘teaching granny ..,’ then please bear with us because there could be someone in the audience for whom a reminder may be helpful. The evening is designed to examine the six areas of greatest concern to General Aviation in the UK - the GA Safety Six. These feature in the CAA’s Safety Plan for 2014 - 2017 (there is a separate card in the pack listing the Safety Six). We include information, ideas and thoughts from all the different forms of flying found in the General Aviation sector, as well as some from other useful sources. 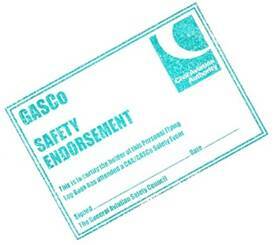 A set of cards accompanies the programme and contains additional information on some of the topics discussed during the presentation, as well as more information about the work of GASCo. They are intended to act as a reminder of the safety evening and not to replace other authoritative sources of information such as the CAA’s excellent series of Safety Sense leaflets which are available to download. The Evening is scheduled to last for 2 hours. There is a short refreshment break during which we will be pleased to endorse log books. If you forget to bring your logbook, please ask the RSO for a pre-signed log book certificate. These are self adhesive and all you need to do is enter the date and location of the event and stick it into your log book.